Lately, I’ve been thinking of what kind of trees I would like to have once I buy my own house. I want something that is not only nice, but also serves another purpose like for fruits or shade. A few entries ago, I posted pictures of a Lemon Grass that I grew. commented on it and mentioned an avocado, which I didn’t even think of. So I read the link that she gave me and have been reading up on growing avocados. 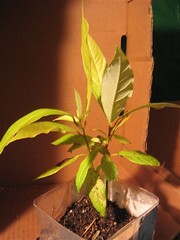 This entry was posted in Uncategorized and tagged avocado, compost, found, lemon grass. Bookmark the permalink.